Croissants. Not just any croissants. 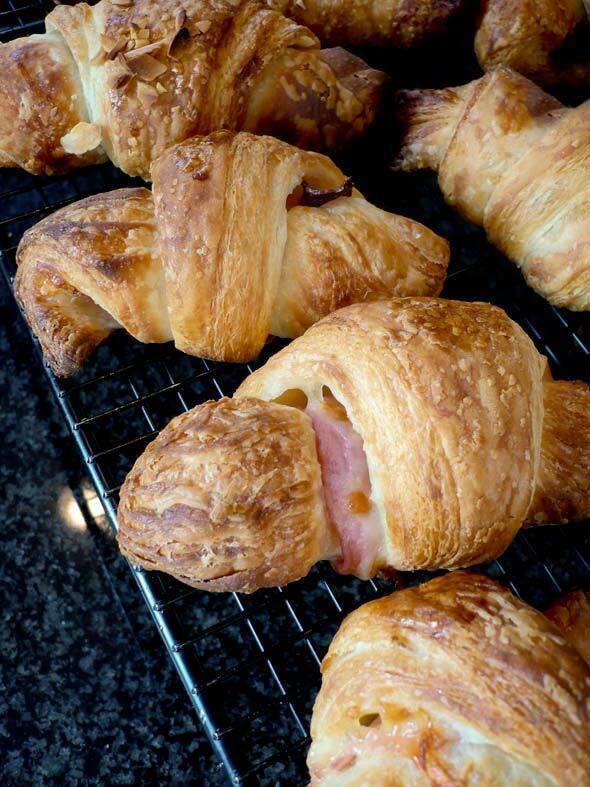 Freshly baked ham and cheese croissants. And not “croy-santz,” but true, honest-to-god, homemade “krwa-sawhn.” That’s what I’m talking about. I don’t make croissants nearly as often as I should. For the longest time, I’ve relied upon my dear friend Cindi Kruth. Cindi is one of our recipe testers, as well as one hell of a baker. The One and I went over to her and her husband Martin’s home one Saturday morning last autumn, and what awaited us? These croissants. About two dozen of them, fresh out of the oven. As soon as we walked in the door, she swung around with a rack of these in her hands. I’m not ashamed to admit I ate about six myself. How could I not? Yes, yes, I can imagine what you’re thinking now, as you look below for a recipe and don’t find one. How much ham and cheese are we supposed to use, David? Why haven’t you included the recipe, David? Are you trying to torture us, David? Merde, Cindi. Now I want some ham and cheese croissants, dagnabbit. Photo © 2012 David Leite. All rights reserved. All recipes and photos used with permission of the publisher.